What I love most about cooking is throwing things together, experimenting with flavors, and tasting what I've created (and of course seeing Jon's reaction!). 2. Chop zucchini, green onions and tomatoes into small pieces. Add to cous cous and toss. It was really good, but I think I'll make some changes next time - more olive oil, fresh basil, chic peas, and some garlic would complete this salad. Jon wasn't crazy about it, but he's not a cous cous fan. My mom, dad, and sister all loved it, but agreed that more olive oil would make it a lot better. 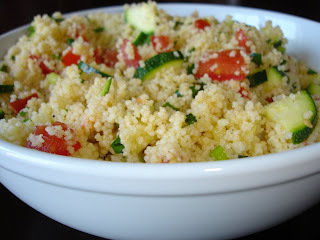 Seriously, couscous is the perfect salad maker to use with leftovers!